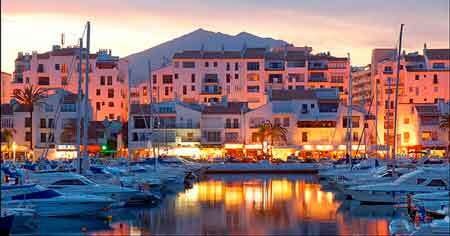 The Jose Banus Port has 915 berths for boats length between 8 and 50 meters. It occupies an area of 15 hectares and its depth varies between 6 and 3 meters berthing and 7.5 meters at its mouth. Average occupancy of ships is from 760 to 800 daily. It is located between Marbella and New Andalucia, towards San Pedro de Alcantara, with two beaches, one located to the west and one to the east, where it is usual practice water sports. Similarly, it is flanked by some of the most exclusive developments in the area as can be MALIBU BEACH, LOS NARANJOS or ESMERALDA BEACH , located in the so-called "Golden Mile" of Marbella. Among the services offered by the port area it stands out in its dry dock lift 50 tonnes and a 6-ton mobile crane. In addition to carpentry, painting, ..., which are offered all kinds of water supplies. Alongside the facilities are four public car parks with more than 2,000 vehicles capacity. Also has security service and fuel supply 24 hours a day. Moreover, social and cultural activities are promoted through its Club del Mar. 4.6 of 5 based on 1108 votes.